Here are a couple of drawings from Mad Magazine artist Jack Davis. I believe he did these for TV Guide magazine in the 1960s for 2 wacky out of this world sitcoms. Get Smart: everyone has probably seen either the original (with Don Adams as Maxwell Smart) or the movie with the 40 Year Old Virgin dude. Davis satirizes all the spy gear in this pinup, just like the TV show did. 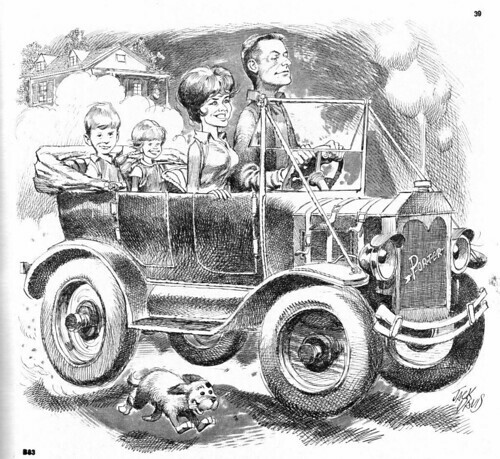 My Mother the Car: this Jerry Van Dyke sitcom is classic and not in a good way! It's pretty out there for a Christian America to follow that a woman's soul has been reincarnated in an automobile. But hey, it happened to Jerry, at least for 30 episodes until it was cancelled. Somehow I kept seeing it over and over in re-runs. Davis captures Jerry Van Dyke perfectly in this image. 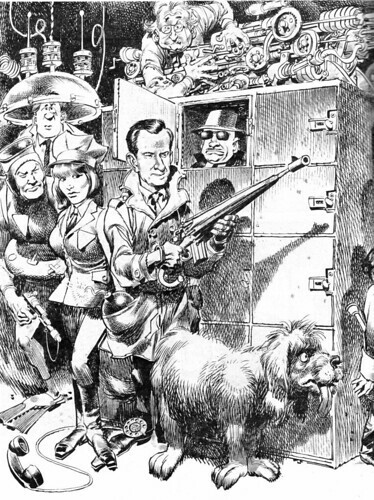 I have to hunt down more wacky Jack Davis drawings. Nuff Said!